Instead of writing lengthy reviews (as I have a tendency to do), I thought I’d share quick looks at two of my reading obsessions from this past week. I love Lying Cat. And that’s the truth. What can I say about the glories of the Saga series? In a nutshell, this comic series tells the story of two star-crossed lovers, Alana and Marko. Their worlds have been at war for generations, and when they desert their respective armies and begin life on the run together, they’re hunted and despised by both sides. The world of Saga is utterly wonderful, with bizarre beings such as Lying Cat, a race of robots with TV screens for heads, an adorable little seal-like creature who’s dangerous AF, and so much more. The artwork is astounding, with a mind-blowing array of gorgeous, strange, and often disgusting creatures and people and planets. The storyline is intense and always surprising, with plenty of danger and violence, but also some truly funny dialogue and situations. Saga is available as standard comic editions, but I prefer to wait and read the trade-paperback editions. The 8th paperback volume just came out this month, which is what prompted my Saga binge this week — I re-read #5, then continued straight through 6, 7, and 8. There are also deluxe hardcover editions available, and if I’m ever feeling super rich, I will absolutely treat myself to those as well. 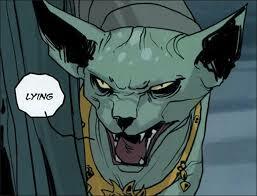 Saga is amazing, people! Don’t miss out. Neverwhere is a classic Neil Gaiman fantasy, originally written as a teleplay for BBC in 1996 before being turned by Gaiman into a novel… which he then continued to tinker with over the years, until now, more than 20 years since its inception, Neverwhere has been published in the author’s “preferred” version of the text, with gorgeous, haunting black-and-white illustrations by the talented Chris Riddell throughout the book. Neverwhere is the story of Richard Mayhew, an every-man who stumbles out of his normal life and into the dark, hidden, magical world of London Below. Swept away from everything and everyone he thought he knew, Richard finds himself embarking on a quest with the Lady Door, a bodyguard named Hunter, and the mysterious yet dashing Marquis de Carabas. As they avoid the deadly assassins Mr. Croup and Mr. Vandemar, Richard and his comrades journey through sewers and non-existent underground platforms, meet angels and beasts, and visit the Floating Market. Finally, when Richard has a chance to return to his former life, he has to decide whether he really wants “normal” after all. I originally read Neverwhere years ago, and gave it only 3-stars at the time. To be honest, I’m not entirely sure that I even finished it, since the last half of so of the book seemed completely new to me. The illustrations here really add to the story, bringing the strange characters to life and adding interest and intrigue to practically every page. At its heart, Neverwhere is a portal story, where a character steps from our world into something new and different, facing dangers but also encountering wonders beyond imagination. Perhaps my appreciation for this type of tale has grown over the years, but I did enjoy the story a lot more this time around — and the illustrations definitely helped me get into the strange world of Neverwhere in a new and marvelous way. For more on the artist’s process of illustrating Neverwhere, see this article. And below, enjoy a few snippets of pages from the book. (Click to view larger versions). Ooooh yesss, Saga! I love it so much and have a soft spot for lying cat as well 😉 i only read 1 & 2 so far but can’t wait to continue! 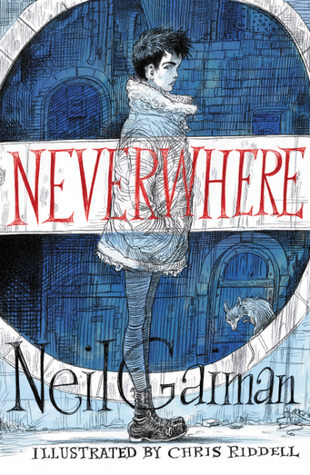 The audio version of Neverwhere is narrated by Gaiman, he is a terrific narrator. He also did an amazing job on The Graveyard Book. This illustrated version looks really interesting. I’ve listened to his narration of some other books, and I agree, he’s a great narrator! I loved his narration of Stardust, and I’m looking forward to listening to The Graveyard Book too. SAGA. I just finished No. 5 and bought the rest of the series. I’m so stoked to continue reading it! Interesting book reviews – I have only read one Neil Gaiman book – The Ocean at the End of the Lane – I thought it was excellent. He has an amazing imagination and endless ideas, doesn’t he?